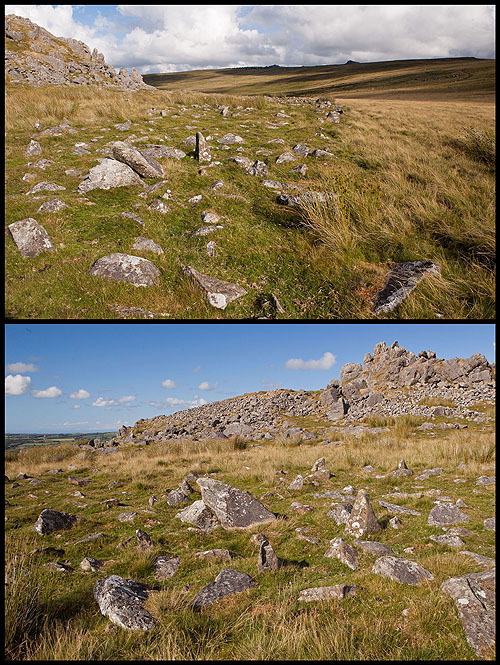 Carn Alw is a rocky outcrop with a fortified Iron Age settlement. Enclosures , hut circles ,long huts , walls, etc. can be seen here. The Iron Age enclosure at Carn Alw was defended to the North and East by the rocky outcrop . To the West / South West , a Chevaux-de-frise , a defensive feature constructed of numerous stones set upright in the ground , in roughly three bands , protected the enclosure . An avenue of small stones through the Chevaux De Frise lead to the main entrance. Chevaux de frise means "Horse of the Friesland" , so called because anti cavalry obstacles were first used by the Frisians in the 17th Century.